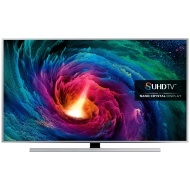 alaTest has collected and analyzed 89 reviews of Samsung UE55JS8000 Series. The average rating for this product is 4.3/5, compared to an average rating of 4.6/5 for other products in the same category for all reviews. People are impressed by the remote control and price. The design and usability also get good reviews. The energy efficiency and reliability get critical views, and reviews are divided on the size. We analyzed user and expert ratings, product age and more factors. Compared to other products in the same category the Samsung UE55JS8000 Series is awarded an overall alaScore™ of 91/100 = Excellent quality. It's alright but would be better if it was curved. The weight a little bit heavy. It has a stunning picture and the sound quality is good, although that is improved with a sound bar. There isn't a direct one-touch button to switch the subtitles on and off and it has a rather complicated menu structure. Doesn't automatically switch to DTS or Dolby sound. Very slow when starting up, due to external HDMI one connect box. USB connections slow to respond. Weekly TV guide does not update beyond 7 days - very annoying. Excellent all round smart TV. Picture in HD is superb,watching football in the on Sky is brilliant. Need to add a sound bar to get the optimum sound.